Editing photos is one of the key parts of photography. This has been true since the days of film. Thankfully, we no longer need to use strong chemicals or stand in darkened rooms for prolonged periods of time to edit our photos. Nowadays there exists powerful photo editing software to help us get the most out of our digital images. As a professional photographer and travel blogger, I spend a great deal of time editing our photos, which means I’ve tried a lot of the various software that is out there in order to figure out which works best. Of course, best is subjective, but hopefully by the end of this guide you’ll have an idea of what might be best for you. 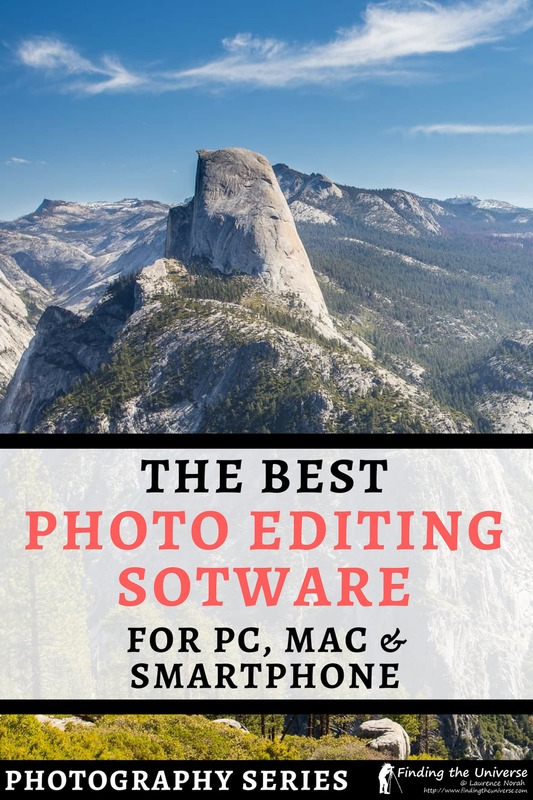 In this post, I’m going to go through a list of some of the best options for editing photos, including paid software and free software. I’ll also be including photo editing software that works on computers (Windows and Apple) and photo editing apps for smartphones (iOS and Android). First though, I want to go through some of the reasons why you need to edit your images to get the most out of them. Why Should You Edit Your Images? So Which Photo Editor is the Best? To make our images as good as they possibly can be, it’s essential to edit them. This is particularly the case if you are shooting in RAW. You can read all about what RAW is and why you should shoot in RAW here. When a camera takes a picture in RAW, it saves the unedited image data to the camera’s memory card. This will have no sharpening, saturation or other tweaks applied, and the image will nearly always look flat and dull. A RAW file is basically the equivalent of a roll of film – it needs “developing” in order to turn it into a usable image. This is what photo editing software is for. If you shoot in JPEG, you can still edit your photos using the tools in this post, although the amount of change you can make to the image will be reduced. However, it is often still worth editing a JPEG file, even if just to crop and straighten it, and tweak the colors a bit. I am sometimes asked if editing photos is not cheating in some way. The answer is no. If you do not shoot in RAW, all that happens is that the camera applies a variety of software algorithms to your image data to produce a usable file, usually in JPEG format. Basically, the computer inside the camera is acting as a mini photo editor that you have no control over. As a photographer, you want to have control over as much of your image creation process as possible, from composing the shot to setting up your camera correctly to editing the image. When people ask me if photo editing is cheating, it’s often because they are conflating photo editing with what has become known as “Photoshopping”, named for the Adobe product called Photoshop. 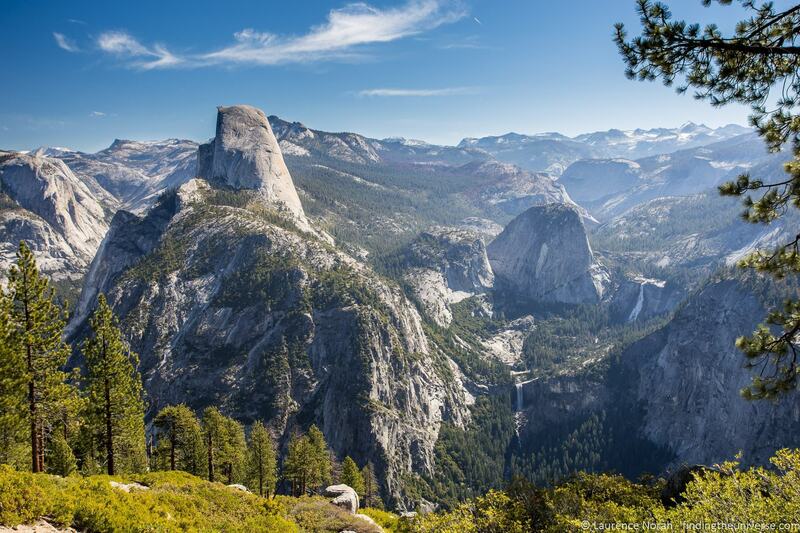 There is a fairly key difference between editing a photo, and Photoshopping a photo. Photoshop, as is further explained in the post, is a very powerful tool for manipulating digital image files. It’s great for adding and removing elements, and effectively changing the look of the image. Photo editing on the other hand, is more about tweaking an image without significantly altering it’s main components. So removing an object from a scene is more about digital manipulation, whilst adjusting the sharpness or saturation of an image, whilst still altering it, is not the same as fundamentally changing it. To be fair, there isn’t really such a thing as cheating in photography, unless you are entering a contest which prohibits the use of certain tools in order to achieve a more pleasing composition, or you are trying to portray a scene that isn’t representative of real life. Photography is a type of art, so as long as you are clear with your intentions and the path you took to the file result, and do not attempt to mislead, you are welcome to edit your photos however you like! There are a lot of photo editors out there, all of which offer a variety of features. Whilst many offer similar tools for editing photos, there are a few key features to consider when picking the right software for you. If you are shooting in RAW, then you need to make sure that the software you buy supports RAW in general, and also supports the RAW files that your camera specifically produces, as each camera is different. The more expensive and well known photography editing tools all support RAW editing, giving you greater control over your edits. They also regularly update the cameras that they support. Not all photo editors do support RAW editing though, and even if they do support it, camera compatibility is not always guaranteed, especially if you have a less common make or type of camera. So always check first before buying – there should be a list of compatible cameras somewhere on the software’s website. Whilst all photo editing software will provide tools for editing an image, far fewer programs offer a photography management tool as well. A photography management tool is what a photographer uses to manage their photos. It’s sort of like a virtual library of images, which can be sorted and arranged by all sorts of methods. It makes finding and working with images a lot easier, and simplifies the photography workflow. Personally, I find having management and editing capabilities all in one place a lot easier, as it saves me having to bounce between programs, one for photo management and one for editing. Of course, your personal needs may vary. Some of the more popular photography editing products have a wide range of third party software or presets that works with them. So for example, some photographers sell presets for Adobe Lightroom, which allows other photographers to achieve a similar look in their images, without having to spend a long time with the various settings and sliders trying to recreate them. Plugins are a similar story – they add extra features to the software that can be very useful. For example, there’s a powerful plugin for Lightroom called LRTimelapse, which helps photographers produce timelapse videos from their photos. More advanced photography editing tools will sometimes have more advanced capabilities that more experienced photographers may find useful. For example, some editing tools have support for multiple image layers. This lets you load multiple images as layers on top of each other, and work on them together. So for example, you could load different exposures of the same image on top of each other, and blend them to create a more pleasing exposure. Or, you could take multiple shots of a busy location, and then using layers you could edit out the people in the scene. Using layers is a more advanced photography technique, and is more about photo manipulation than photo editing, but it can be useful in certain situations, so if this will be important to you, you should make sure you get software that supports it. Other more advanced features include things like HDR merging, focus stacking, and tethered capture. For paid photo editing software, there are two major pricing models. The first is the standalone, one-off pricing model, where you pay a fixed up front fee, and you then own that piece of software forever. The other model is the subscription model, whereby you pay a monthly or yearly fee, and if you stop paying, you lose access to the software. Each model has its advantages and disadvantages. With the fixed price model, whilst there’s only one up-front cost, you tend not to get any updates to the software, and over time, you will not get new features or guaranteed compatibility with new lenses or cameras. If you want these, you will have to pay for the next version of the software. The subscription model, whilst it may seem more expensive (depending on the software package), comes with the benefit that you will regularly receive updates and new features to your software. On the whole, both pricing models tends to work out at roughly the same price if you factor in the cost of regular upgrades. So we generally recommend going with a subscription model to keep the software updated. Of course, if you just want some software that you can pay for once and that will work with your existing equipment, that is certainly a good idea, and some of the products we recommend are sure to keep working for years to come without needing upgrades. Now we’re going to go through our favourite photo editing software on the market. This first section covers paid photo editors, which range from a one-off price of $35 up to $300+. Whilst many of these tools offer similar features, the differences are worth noting, as the right software for each photographer depend on their needs. Lightroom is our pick for the best photo editing software, and is the product we use for 95% of our photo editing needs. We love that it pretty much the complete package for photographers. It has a full photo management tool which is far and away considered the best in the industry, and it also has an excellent and fully featured photo editing toolkit, with full RAW support. 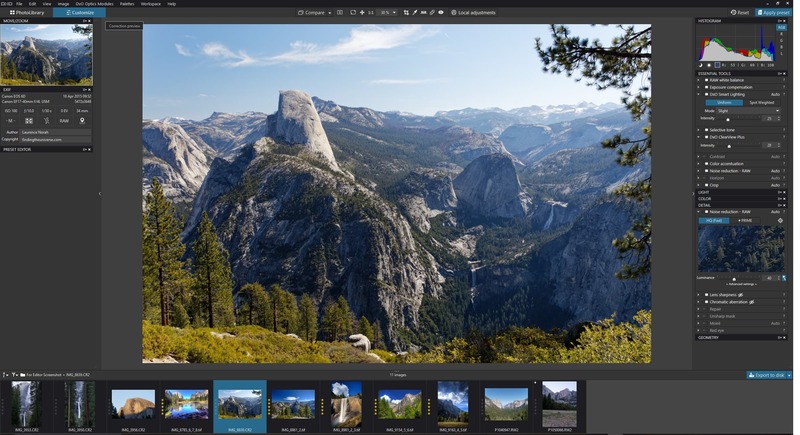 It also integrates with Adobe Photoshop, which comes with Lightroom as part of the photography subscription, which is the recommended way to access it in our opinion. That means that if you want to do something more complicated like working with multiple layers, or advanced photo manipulation, the integration is seamless. It isn’t perfect though. The subscription model can be off-putting, and as it is so feature heavy, it has a fairly steep learning curve. 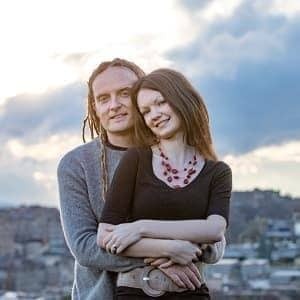 I happily admit it took me multiple tries over a year to finally start using it properly, and that was only after a fellow photographer sat me down and walked me through the features. It’s also known to need a high powered computer to run properly, and even then performance can be an issue if you have a lot of images. We’ve written a guide to making Lightroom faster, but there’s only so much you can do as ours still runs slowly at times. Note that Adobe has a very confusing suite of products, and our recommended version is Adobe Lightroom Photoshop Classic CC. There is another version, known as Adobe Photoshop Lightroom CC, which focuses more around cloud editing, and has less features. However, it does have more automated tools. Finally, Adobe also has Adobe Photoshop, it’s more advanced editing tool, and Adobe Photoshop Elements, which is a more simplified tool, which we will discuss next. Available for: Windows / Mac. There is also a Smartphone app version of Lightroom CC available for Android and iOS. If Lightroom sounds all too much like hard work, you might be interested in Adobe Photoshop Elements instead. This is designed to be easier to use, but still offers a range of photo editing and photo management tools, along with the same RAW file editing engine that you get in Adobe Photoshop and Adobe Lightroom. Note, as previously mentioned, Adobe Photoshop Elements is an entirely separate product to Adobe Photoshop or the various versions of Adobe Lightroom, and it does not come as part of the Adobe Photography subscription as it is offered for a one-off single purchase price. Photoshop Elements lets you edit your photos, and has an interactive tutorial mode where it will walk you through common tasks like sharpening an image or straightening it. It also has handy features like letting you create photo collages, and adding text to images. Photoshop Elements is also pretty smart. It incorporates Adobe’s Sensei technology, an artificially intelligent system that does things like find your best photos, apply automatic edits, and find and group people in your photos. It also supports keywording and photo rating. If you want to make your photos better but don’t want the overhead of spending hours at your computer, Elements is a great option. It’s also available as a one-off purchase, meaning you just have to buy it once and it’s yours forever. Finally, as it’s part of the Adobe ecosystem, if you choose to upgrade to Lightroom / Photoshop, your keywords, image ratings and so on should copy across. If you want to improve the look of your photos with absolutely minimal effort, Photolemur is the software for you. 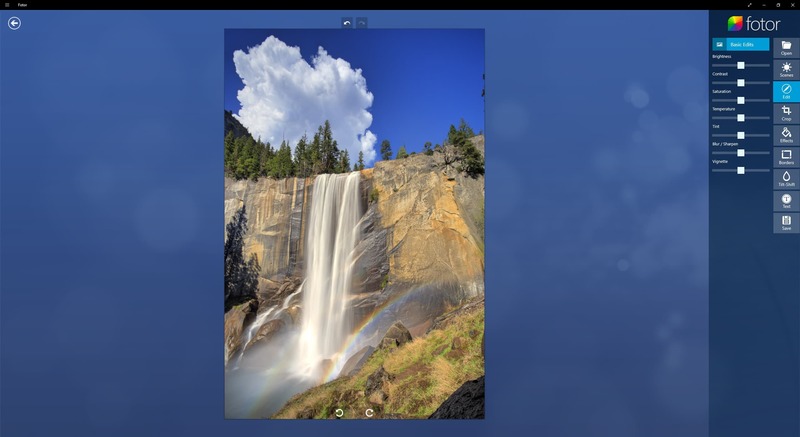 Photolemur offers 1-click photo editing. All you have to do is load your image into Photolemur, and it uses its own proprietary AI powered software to apply what it thinks are the best edits to your images. It also supports RAW files, and is available as a plugin to both Lightroom and Photoshop, as well as an extension to Apple Photos. This isn’t a photography management tool though, so it can only be used for photo editing. You also have limited control over the final output, as the software is designed to be super simple to use, and essentially it does almost everything for you. If better photos with absolutely minimal effort is what you are after, Photolemur is a really inexpensive option. It’s also a one-off purchase price, meaning no subscription, and you can download a trial here to give it a go and see if it works for you. 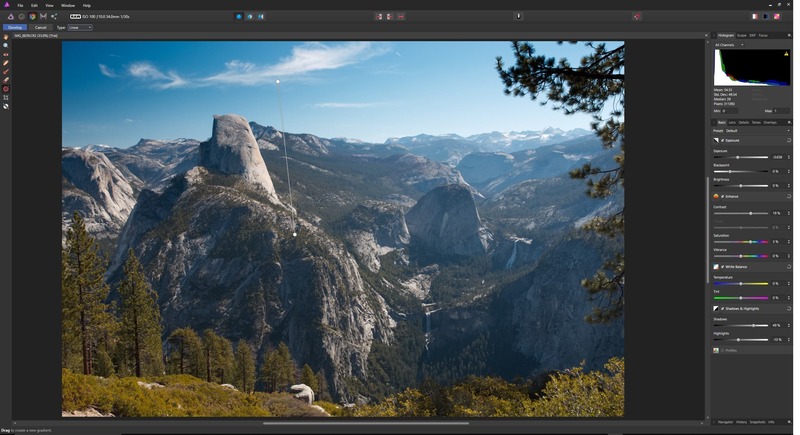 Skylum’s Luminar software has come a long way since it first launched as a photo editor. The latest version includes both photo editing and photo management tools, and whilst the latter aren’t as comprehensive as Lightroom, they are certainly enough to get the job done for most needs, with everything from keywording to image rating available. Luminar also features full RAW support, and a range of AI assisted editing tools. Skylum also owns the previously mentioned Photolemur tool, and you will notice many similarities in the tool capabilities if you use the two. Unlike Photolemur though, full manual editing controls are also available. This means you get fine-grained control over each effect, as well as the option to stack effects, and gives much better results in our opinion. 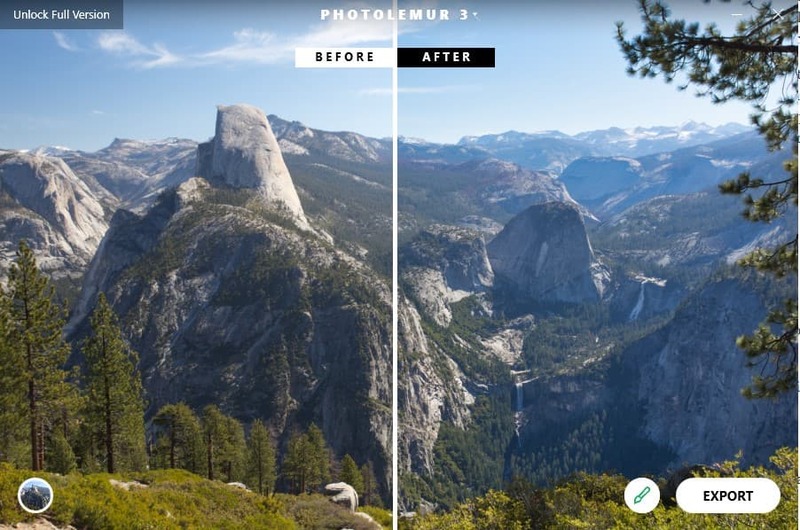 Lumiar’s overall interface and editing tools are definitely easier to pick up than something like Lightroom, and for quick edits especially, it shines. Luminar also features layers support, which is something Lightroom doesn’t natively support. The best thing about Luminar though, given its robust feature set, is that it’s available for a one-off purchase price that is very reasonable. This makes it a great option for those of you looking for something that will do pretty much everything you might need, including photo management, but without ongoing fees. In our experience it performs well, and is our runner-up as our favourite image editing software overall. You can buy it here, and that page also has a trial version so you can see if it’s something you might find useful. 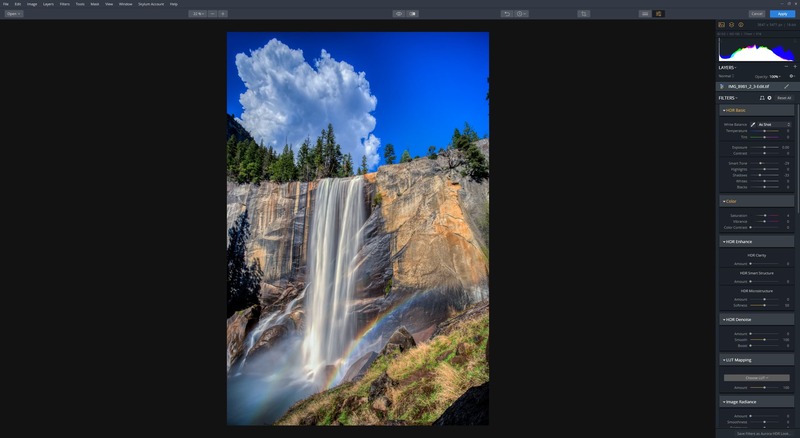 As the name suggests, Aurora HDR is a fairly specialist photography tool that can be used to help users create High Dynamic Range (HDR) images. High dynamic range images are generally created by merging multiple exposures of the same scene and then applying various algorithms to the merged image, in order to balance out the image. This can then create a final image that will hopefully look more realistic to the eye, with a correctly exposed sky and shadows. This is particularly useful for landscape and architecture photographers, as the range in brightness levels in these scenes can result in parts of the shot either being overexposed or underexposed, as our cameras do not have the same dynamic range of our eyes. HDR images can also look quite garish and unrealistic, depending on the processing used, and as previously mentioned, requires specialist software to line up and overlay the images, and then merge them into one correctly exposed image. Aurora HDR handles all of this, taking the original source RAW files, aligning them if necessary, and merging them into a final HDR image. Over time, it has matured into a very capable HDR product, giving you a great deal of fine grained control over the look of your image, and letting you create shots that can range from very natural to very artistic. Whilst Lightroom, Photoshop, and other tools also allow for merging of exposures to HDR, they do not offer the fine grained control of Aurora HDR, nor are they available for a standalone price. If HDR imagery is a strong interest of yours, this is probably the best piece of software on the market. 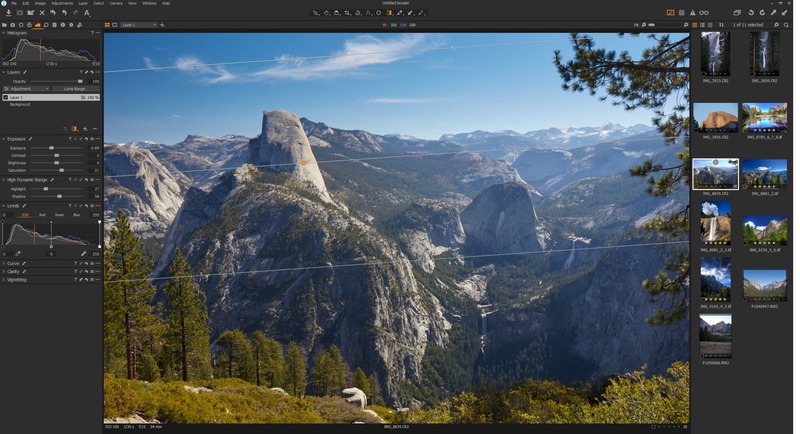 As with Skylum and Photolemur, Aurora HDR is part of the Luminar family of photo editing products. You can buy Aurora HDR here, with a trial version also available on the site. Note that sometimes it is available as a deal with other Luminar products, which it compliments well. 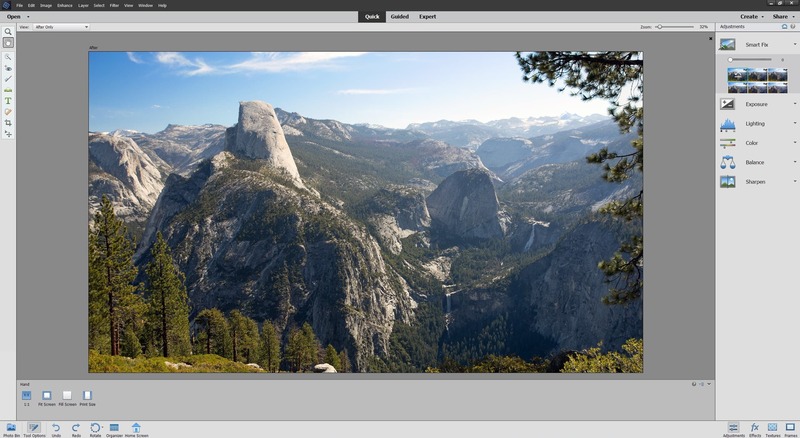 ON1 Photo RAW is an advanced photography editor, which also has a fairly full featured photography management toolset. As the name suggests, ON1 Photo RAW comes with full RAW support, as well as all the advanced editing tools you would expect to find. These include both the standard slider editing tools, as well as a series of built-in filters (more filters can be added) for quicker editing. Unlike Lightroom, ON1 Photo RAW supports layers, and has a number of fairly advanced tools including tools to remove unwanted images and blemishes, HDR merging, focus stacking, tethered capture, and a proprietary resize tool that can enlarge images with minimal quality loss. There is also support for presets and filters, and the program ships with a number of these out of the box, with many more available online. In terms of the interface and learning curve, ON1 is fairly complex, and I would say it isn’t ideal for beginners – although if you are used to something like Lightroom it won’t take you long to pick it up. It also requires a pretty high specification PC to perform well, and using layers in particular can slow it down. For the price though, it’s great value, especially considering it’s available for a one-off fee rather than a subscription model. It has an excellent range of features, and whilst a little clunkier than Lightroom / Photoshop, it will certainly get the job done if you put the effort into learning how to use it. When it comes to noise reduction, DxO Photolab offers best in class performance with their incredible Prime denoise technology. So if you often find yourself shooting high images at high ISOs (3200+), and wanting to clean up the graininess and other noise, DxO’s Photolab is definitely a fantastic option. 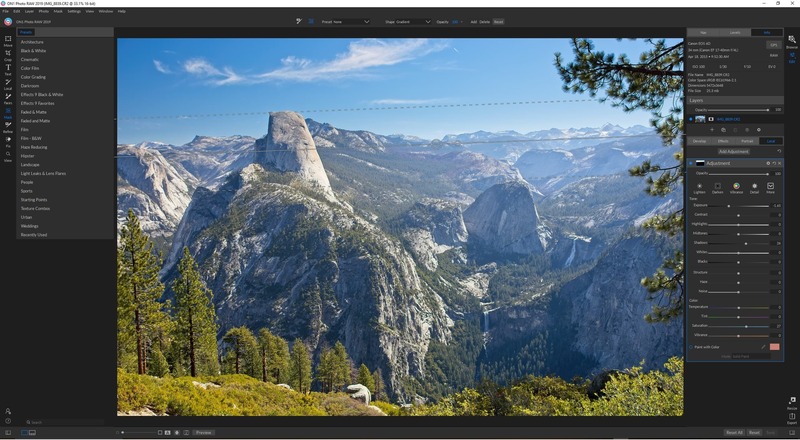 Otherwise, DxO is a powerful photo editor which offers all the editing tools you could need. It’s notable for its lens and camera presets which apply an optimal look to an image (if your lens and camera combination is supported) to create cleaner and sharper looking images. DxO does have a workflow module, but it’s very limited and doesn’t have anywhere near the features of Lightroom. However, it does work as a plugin for Lightroom, which is a good way to take advantage of the noise capabilities it offers. Just note that the noise reduction software, whilst incredible, is also relatively slow compared to other editing software. So whilst it produces great results, it takes its time to do so! DxO doesn’t have layer support, but it does offer full RAW support and all the other editing features you would expect. It’s also reasonably priced for the images it produces, but bear in mind you’ll need another piece of software to manage your photos if you want to do that as well. It’s available in two versions with a trial available. We advise the Elite version, as the basic version doesn’t feature the advanced noise reduction capabilities. 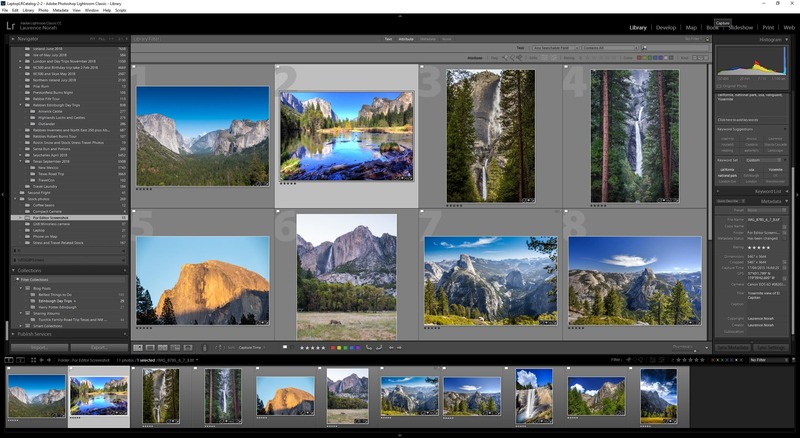 PhaseOne’s Capture One Pro is a serious alternative to Lightroom, offering both photo editing and photo management capabilities. It is particular popular with studio photographers, as it allows for fast and easy tethered capture of images – basically you hook your camera up to your computer running Capture One Pro, and the images appear in the app ready to edit in real time. Whilst other apps can also do this, PhaseOne is generally regarded as being best in class for this particular feature. Capture One Pro is also popular with photographers who appreciate its excellent RAW engine, which produces great colours and sharp images, and it is also known for its speed of operation if you have a capable computer to run it on. Naturally it has full RAW support, as well as third party plugin support and support for layers. Of course, not everything is perfect. This is a complex tool with a lot of features, and as such, the learning curve is steep. This is the case even if you are coming from another editing tool like Lightroom, as the layout and design philosophy is quite different. It’s also one of the most expensive photo editing options available, and whilst it is available for both a one-off perpetual license payment or as a subscription, the price point is definitely higher than most other available tools. By this point, Photoshop is so well known as a tool that Photoshop has become a verb. Photoshop is, despite the name, not really a tool designed specifically for editing photos. It’s a tool for digital artists to use to manipulate graphics, which can include photos. Lightroom actually features the majority of Photoshop’s photo editing capabilities, which have been streamlined into those tools and features that photographers really need on a day to day basis. For many photographers therefore, Photoshop has become more of an add-on to Lightroom. It is used to perform more specific and complex tasks that are beyond the scope of Lightroom, such as working with layers, and complex image manipulation tasks like removing or adding items to a scene. Photoshop is a hugely powerful tool, which is also somewhat challenging to learn how to use. Thankfully, there are thousands of guides and tutorials online. 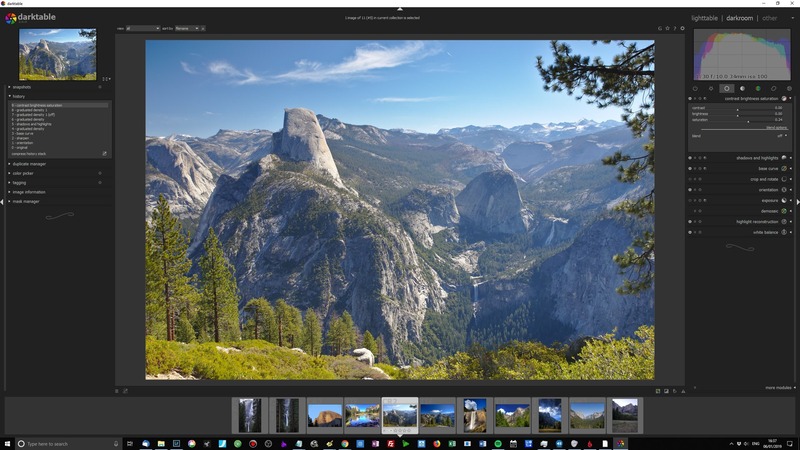 The good news is that you don’t need to decide between Lightroom and Photoshop, as the annual photography subscription plan from Adobe includes both these pieces of software. We think this is incredible value for money, if you are willing to put the time into learning how to use these tools effectively. 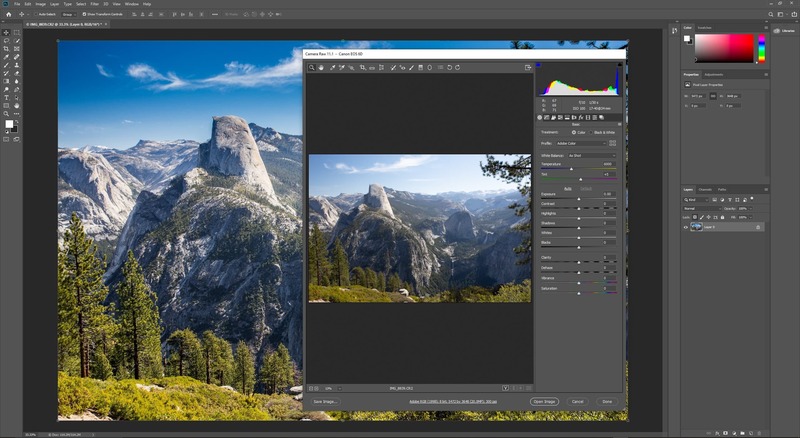 If you’re looking for a Photoshop like product that doesn’t cost a lot or require a subscription, we can definitely recommend taking a look at Affinity Photo. 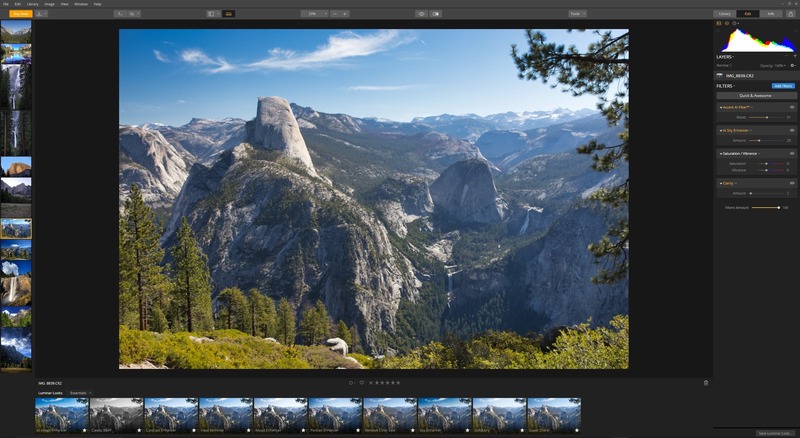 Whilst it has no image management capabilities, it does have very powerful image editing and RAW support, as well as HDR capabilities, support for layers, focus merge capabilities, and lots more. 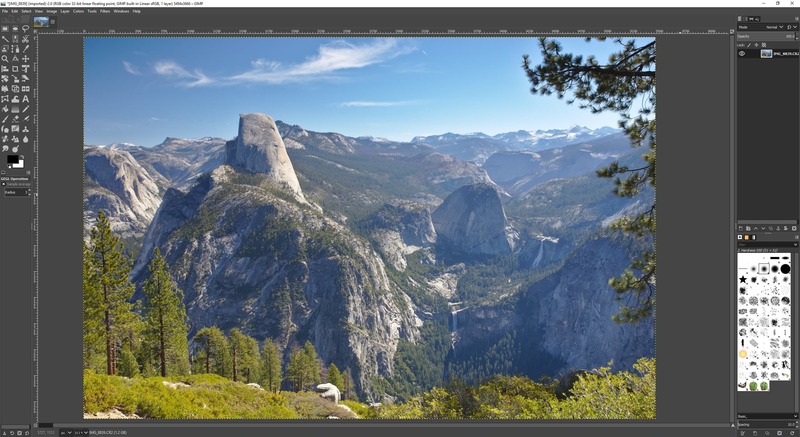 It’s also remarkably well priced and performs very well, and with versions available for Windows / Mac and iPad, this is certainly an option to consider as a cheaper Photoshop alternative. Available for: Windows / Mac. Version also available for iPad. Whilst we generally recommend one of the paid options for photo editing as they tend to offer the most features and well supported, there are some free options to consider. For quick-on-the-go mobile editing on our smartphone, our favourite option is entirely free. For mobile editing, Snapseed is our go-to app. The fact that it’s free is a bonus – we’d happily pay for an editor of this quality! Snapseed has everything you could want from a mobile photo editor. It has all the normal features you would expect, from adjusting image levels and image levelling, through to more advanced features and filters that will let you create pretty much any look you are after. Snapseed also features text editing, so you can add text to images, plus you can save your edits as presets for use with other images, or to share with friends. Finally, it also supports RAW files in the DNG format, which is the most common format used by the small number of smartphones which shoot in RAW. Of course, this being a mobile app, Snapseed has limitations. It doesn’t do any photo management, it doesn’t support layers, and it doesn’t currently have any noise reduction or lens correction capabilities. However, as this is a mobile app primarily designed for editing the photos taken by a smartphone, these are not really things to be expected. For the longest time, Darktable has been the go-to free RAW editor of choice for Mac. Then, in 2017, support was added for Windows users as well, making it an even more accessible option. Darktable is definitely one of the better free RAW editors on the market. It has everything you would expect from a RAW editor, including all the tools you would find in paid apps for controlling the look and feel of an image. It also has tethering support. Darktable also has a photo management system, which allows for importing of images and offers various tools for image cataloguing, from keywords to a rating system. Overall, Darktable is probably the closest you’ll get to Lightroom with free software. The learning curve is fairly steep, and the final results might not be quite as perfect as you’d get from a paid product, but it’s definitely a fantastic free option. If Darktable is the free version of Lightroom, then GIMP is the free version of Photoshop. GIMP (which stands for GNU Image Manipulation Program, in case you wondered), is a free and open source photoshop alternative which has been around since 1996 (Photoshop first launched in 1990). Like Photoshop, GIMP is all about manipulation of digital images, and offers the user a vast array of photo tools. Also like Photoshop, this means that the learning curve is fairly steep. There’s no photo management, and you need to install a tool like UFRAW (or Darktable) to enable RAW file editing. All of the above said, GIMP is a fantastic tool for manipulating images if you don’t want to get into the Adobe ecosystem, or would just prefer a free option. There are a variety of third party plugins, and you can do pretty much everything in GIMP that you can do in Photoshop. This comes with the caveat that it will take you a while to figure it out! For quick edits to your photos, Fotor is a reasonable free photo editing option. It has RAW file support, and comes packed with presets and filters that are designed to let you quickly improve the look of your images with minimal effort. It also allows for adding text and stickers to images, as well as the creation of collages. I’ve have found that it can sometimes have issues with colour when loading RAW files, giving them an odd colour tint. This is likely due to a lack of support for my specific camera, so your experiences may vary. There are also various free versions – the version for Windows for example is available on the Windows Store, or as a direct download. We’d advise the Windows Store version if you are on Windows, as it doesn’t tease you with pro only features, and the 1-click edits are easy to access. If you’re looking for something simple to make quick edits, this is an option to consider, and you can see if it suffices for your needs. It also has good platform availability, with versions available for Windows, Android and iOS. There’s no version for Mac, but there is a browser based version available. Note that the free versions of the apps are more limited, but you can upgrade to a pro version if you prefer. Upgrading to the pro version removes the ads and unlocks additional features, such as noise control, however this is subscription based. For the price ($9 / month or $40 / year), we would suggest you consider one of the other options on our paid list instead as we feel those have more features at equivalent prices. The majority of the digital camera manufacturers on the market also make photo editing software. In many cases, this comes free in the box or is available as a digital download to owners of the camera (you will likely need to provide your camera serial number in order to download the software). Normally, this software only works with the RAW files produced by that manufacturers camera, and is only available to owners of that brand of cameras. And whilst they normally only provide photo editing capabilities rather than photo management, they are often very good at what they do. For example, Canon’s Digital Photo Professional software, which is entirely free to users of Canon cameras, is an excellent RAW editor, offering you all the control you need to get the most out of your Canon RAW files. If you have a camera from another manufacturer, it’s always worth checking their website to see if they have software available for photo editing, as this can be a free and easy way to get a good photo editor with guaranteed compatibility with your images. Most Windows and Macintosh computers come pre-loaded with a free built-in photo editing tool called Photos. On both platforms these offer both a photo management interface, as well as basic photo editing capabilities and a 1-click photo improvement option. Unfortunately, the Windows 10 photos app does not support RAW files. The Apple version does, making it more useful as an all purpose free photo editor. Although these are good for basic photo management, storage, and editing, they are quite limited. We would overall suggest trying one of the other options on our list, but we wanted to include these for completeness. Our pick for the best photo editor for desktop is Adobe Lightroom, and for mobile it is Snapseed. Whilst many others have come close, the combination of Adobe Lightroom and Photoshop is hard to beat. Lightroom in particular is fantastic for photo management, and we do 95% of our photo edits in Lightroom. You can pick up an annual subscription here. If the price of entry is too high, or you would prefer not to have to subscribe for your software, our next pick would be Skylum’s Luminar software, which offers a great featureset and ease of use at a compelling price. Of course, the right photo editor for you will depend on your goals and needs. If tethered shooting in a studio environment is for you, then you should try Capture One. If it’s HDR imagery, perhaps of indoor scenes or landscapes, try Aurora HDR. Finally, if you just can’t decide, our advice would be download a few of the above options, the majority of which have free 30 or 60 day trials, and see which works for you – and runs well on your specific system! If you’re looking to learn a new photography skill or concept, check out our guides to lens compression, long exposure photography, RAW in photography, use of ND filters, depth of field and composition, to name but a few. And that’s the end of our guide to the best photo editing software available today! As always, we’re happy to answer questions and receive your feedback. Just let us know in the Comments section below. That may be true, if you don’t know what you are doing. Otherwise darktable is much more flexible and powerful tool at least compared to LR or C1. However i think darktable would be great sw at any price point. and most important for me, it’s possible to blend the output of almost all modules using modes (like soft light, overlay…) and limiting it also via parametric masks (on L,h,C,A,B,g channels). Thank you so much for this! I dabbled in photograph in college (didnt we all?) and while I’ve taken some courses, now that I am (much) older, and we have our own set of adventures we are going on soon in our converted Sprinter Van – this information is SO HELPFUL as I learn more and more about photography. Thank you for sharing!!! You listed some software I’ve never heard of before, like Photolemur . I’ll have to give it a try man! This is a great post Lawernce, very detailed! How about PhotoWorks software for Windows, have you tried it? I find it perfect for beginners (me :D) ! I haven’t tried that one, but thanks for the recommendation!